To Cite: Sharifkashany S, Yazdani N, Ghazavi H, Tajdini A. Laryngeal Paraganglioma: A Case Report, Iran J Radiol. 2014 ; 11(3):e21011. doi: 10.5812/iranjradiol.21011. Paragangliomas in the head and neck are found typically in the region of the carotid body, jugular body, and along the 9th and 10th cranial nerves. They can occur in multicenteric forms, but generally, laryngeal paragangliomas are not found in these patients. Only two cases of laryngeal paraganglioma have been reported with a synchronous lesion elsewhere. We report an additional case of a 34-year-old female with multiple paragangliomas beginning with laryngeal involvement. Paragangliomas are clusters of neuroendocrine cells arising from extra-adrenal paraganglia of the autonomic nervous system. In the head and neck, paragangliomas are mostly found in the region of the carotid body, jugular body, along the glossopharyngeal nerve and its tympanic branch, and the vagus nerve. They account for about 0.6% of all head and neck tumors (1, 2). Paragangliomas of the larynx are rare and unlike the other tumors of the larynx, they are more common in females (female/male ratio: 3/1) with a mean age of 44 years(3). Paragangliomas can occur in familial autosomal dominant traits or multicenteric forms, but generally, laryngeal paragangliomas are not observed in these patients. Only two cases of laryngeal paraganglioma have been reported with a synchronous lesion elsewhere (4, 5). In this report, an additional case of multiple paragangliomas with laryngeal involvement is reported. A 34-year-old female came to the center with complete left facial palsy and left ear progressive hearing loss over a period of six months. She also reported a progressive dysphonia dating back five years. The patient denied having dysphagia, odynophagia, dyspnea or otalgia. A thorough review of systems was otherwise negative. Her past surgical history was significant due to a direct laryngoscopic biopsy for the evaluation of dysphonia five years prior, which led to the diagnosis of a supraglottic mass that pathologically proved to be paraganglioma. As the mass was confined to the laryngeal surface of the epiglottis, the tumor was just resected via a suprahyoid incision, without any damage to the normal anatomy of the larynx. Despite the resection, the patient’s dysphonia was not completely resolved, even so, the patient did not come for a follow-up visit until the facial palsy and hearing loss began. A temporal bone CT-scan without contrast (bone window, axial view) reveals a lytic-expansile mass isodense to the brain in the left jugular foramen thateroded the petrous apex and the osseous septum between the carotid canal and the foramen (Figure 2). Furthermore, a temporal bone CT- scan without contrast (bone window, coronal view) indicates that the mass eroded the floor of the hypotympanic cavity and the osseous labyrinthine nearby, and an extension within the tympanic cavity is also detected that caused mastoid antrum obstruction. It explains the left mastoid ear cell opacity. Erosion of the inferior cortex of the petrous apex is noted (Figure 3). 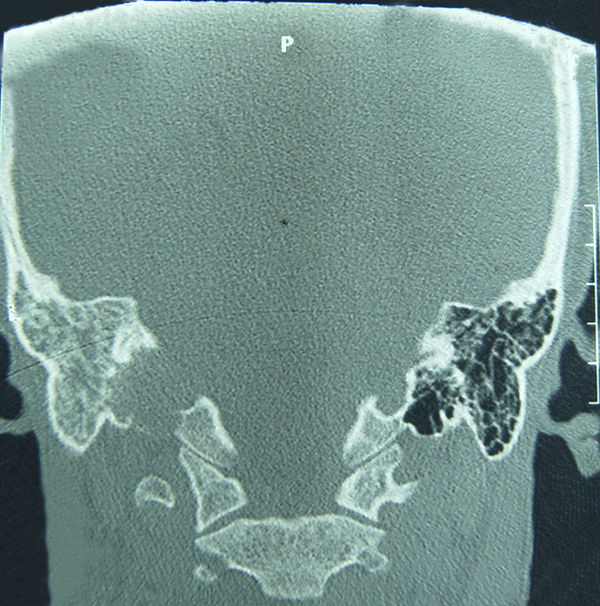 The mass in the left jugular fossa was enhanced in the contrast enhanced temporal bone CT-scan (Figure 4). Figure 2. Temporal bone CT-scan without contrast (bone window, axial view). 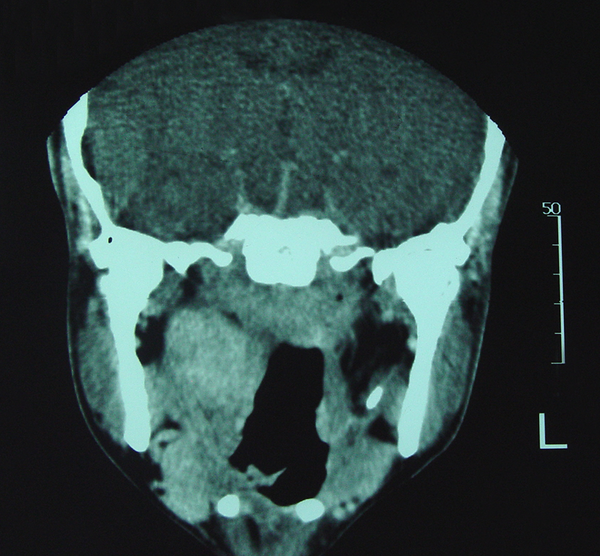 A lytic-expansile mass isodense with the brain is seen in the left jugular foramen that has eroded the petrous apex and the osseous septum between the carotid canal and this foramen. Opacity of the left tympanic cavity and mastoid air cells is also seen. Figure 3. Temporal bone CT-scan without contrast (bone window, coronal view). A lytic-expansile mass isodense with the brain is seen in the left jugular foramen that has eroded the floor of the hypotympanic cavity and osseous labyrinthine nearby and shows extension within the tympanic cavity. Erosion of the inferior cortex of the petrous apex is noted. Opacity of the tympanic cavity and mastoid air cells is also seen. Figure 4. Contrast-enhanced temporal bone CT-scan (coronal view). 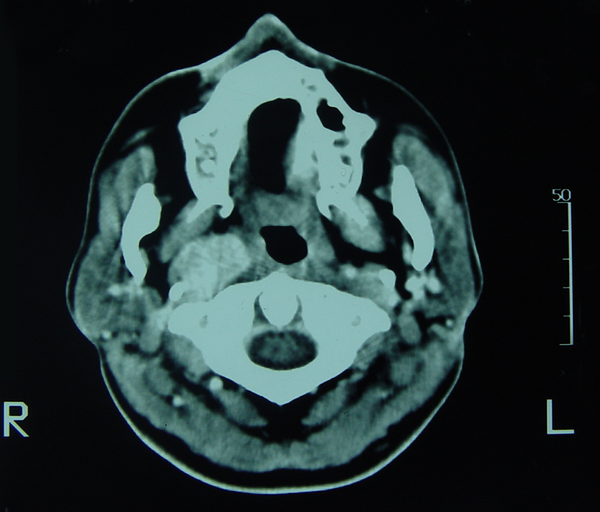 A lytic expansile relatively enhanced mass in the left jugular fossa without any significant intracranial extension. A contrast-enhanced paranasal sinus (PNS) CT scan (coronal view) also showed a well-defined homogeneously enhanced soft tissue mass (35 × 25 mm) in the right parapharyngeal space that did not show any clear boundary with the right pharyngeal mucosal space of the nasopharynx (Figure 5). Figure 5. Contrast-enhanced PNS CT-scan (coronal view). Well-defined homogeneously enhanced soft tissue mass (35 × 25 mm) in the right parapharyngeal space is seen that has not shown any clear boundary with the right pharyngeal mucosal space of the nasopharynx. The findings of the contrast-enhanced CT-scan of the neckare as follows: 1) A soft tissue mass (20 × 15 mm) with homogeneous marked enhancement and well-defined borders in the right vascular space (Figure 6). 2) A soft tissue mass (17 × 10 mm) with homogeneous marked enhancement and well-defined borders on the midline and left side of the preepiglottic space, which has a mass effect on the epiglottis (Figure 7). Figure 6. 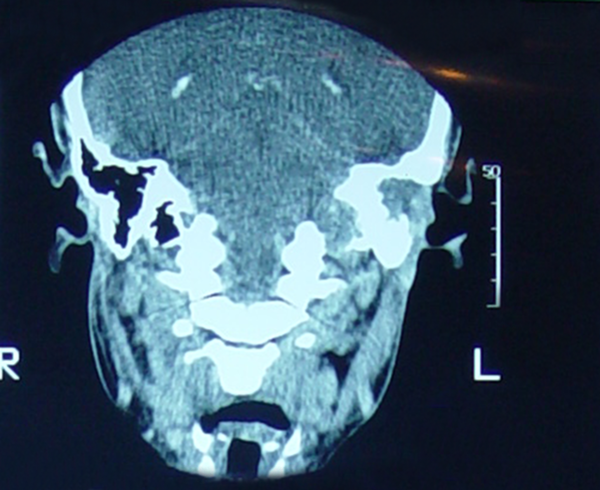 Contrast-enhanced neck CT-scan (axial view). A soft tissue mass (20 × 15 mm) with homogeneous marked enhancement and well-defined borders in the right vascular space. 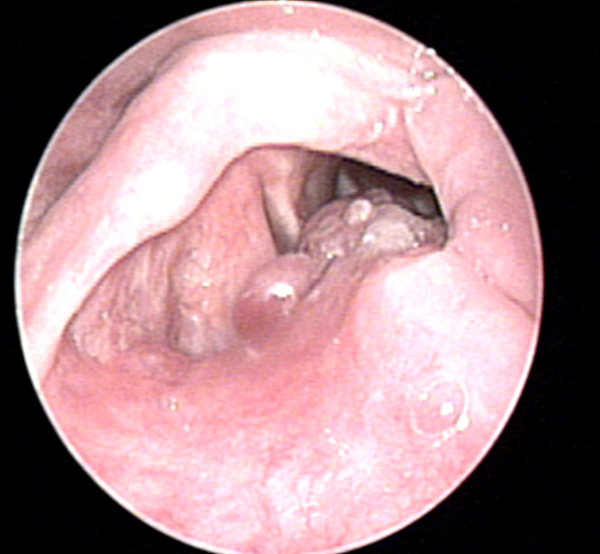 A soft tissue mass (17 × 10 mm) with homogeneous marked enhancement and well-defined borders on the midline and left side of the preepiglottic space is seen that has a mass effect on the epiglottis. 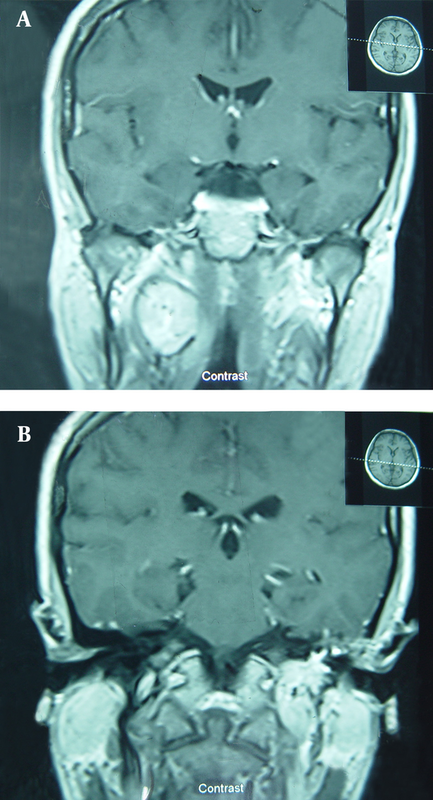 The finding of a contrast-enhanced brain MRI (coronal view) findings were: A) A well-defined relatively homogeneous mass (35 × 25 mm) in the right parapharyngeal space that shows moderate enhancement (Figure 8A); B) Markedly enhancing mass (30 × 25 mm) in the left jugular foramen that shows lobulated borders.An abnormal signal without enhancement in the left mastoid air cells isosignal to the brain gray matter is also observed (Figure 8B). A relatively heterogeneous signal mass with well-defined lobulated borders (30 × 25 mm) in the left jugular foramen was detected with an isointense signal to the brain cortex on a T2-weighted brain MRI (axial view). An abnormal signal isointense to the CSF in the left mastoid air cells and tympanic cavity is also observed (Figure 9). Figure 8. Contrast-enhanced brain MRI (coronal view). 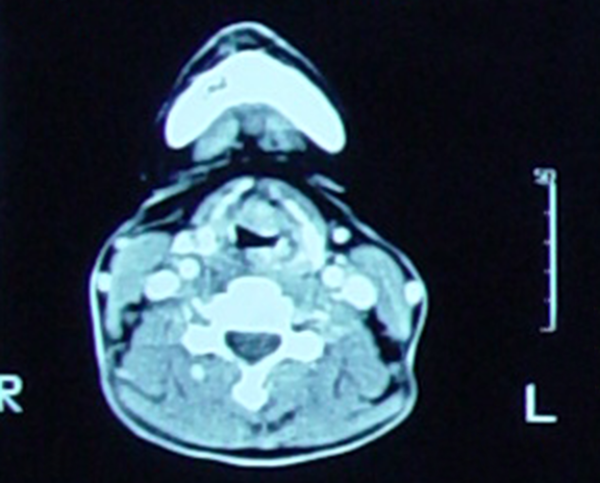 A) A well-defined relatively homogeneous mass (35 × 25 mm) with moderate enhancement is seen in the right parapharyngeal space. 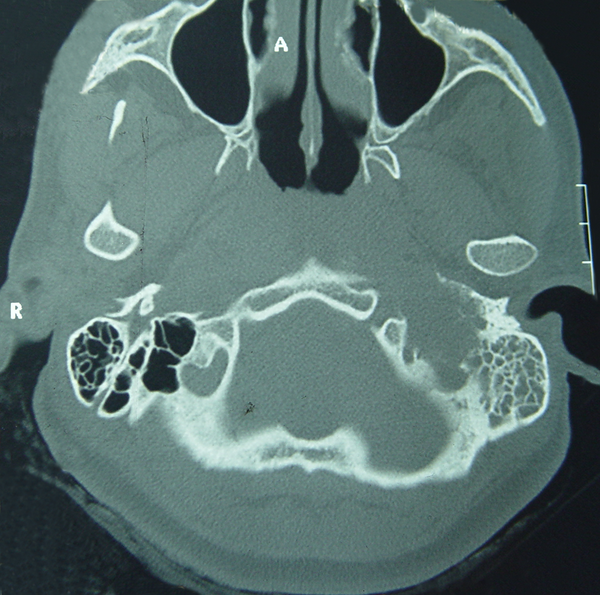 B) A markedly enhancing mass (30 × 25 mm) with lobulated borders is seen in the left jugular foramen. Figure 9. T2-weighted brain MRI (axial view). 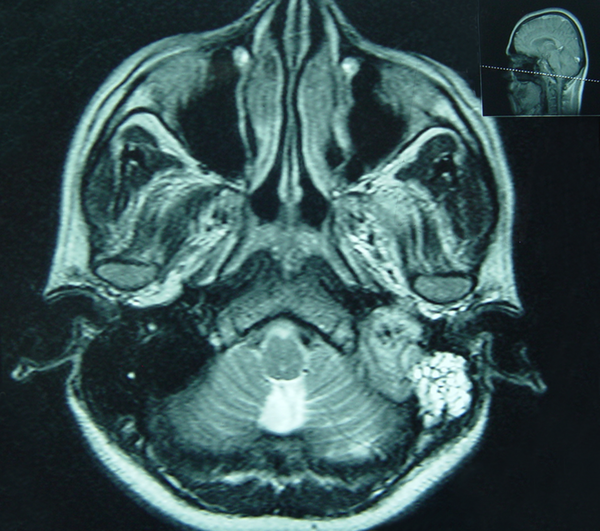 A relatively heterogeneous signal mass with well-defined lobulated borders (30 × 25 mm) in the left jugular foramen is seen that shows isointense signal to the brain cortex. Abnormal signal isointense to CSF in the left mastoid air cells and the tympanic cavity is also seen. An incisional biopsy from the left external auditory canal mass was performed and the pathologist reported paraganglioma. The patient was referred to the oncology center for radiation therapy.Unfortunately, since the patient did not come in for any visits afterwards, there is no data about the course of therapy or any probable recurrence. Paragangliomas are neuroendocrine tumors that arise from the paraganglion system. These masses are an exceedingly uncommon presentation to otolaryngologists, and head and neck surgeons (1). Paragangliomas are known to appear in two forms: sporadic and familial. Multicentric forms of head and neck paragangliomas are usually a result of the familial paraganglioma syndrome (6). Carotid body, jugulotympanic, and vagal paragangliomas are the most common sites of presentation. However, larynx involvement is very rare, specially the multicentric type (1). Depending on the size and location of the tumors, a laryngeal paraganglia may cause dyspnea, dysphasia, hoarseness, stridor and the sensation of a foreign body (3). As mentioned, the patient in this report suffered from hoarseness without any episodes of stridor or dyspnea. The vast majority of laryngeal paragangliomas appear as supraglottic submucosal masses. Only 2% of these tumors are malignant and are often misdiagnosed as atypical carcinoids (5). The laryngeal mass in this patient was also supraglottic and involved the left aryepiglottic fold. As laryngeal paragangliomas are benign tumors, local resection alone is sufficient and elective neck dissection is not indicated; however, recurrence occurs in 17% of the cases (3, 5). This case had been treated with local resection five years prior in another center, but when referred to this clinic with jugulotympanic involvement, a noticeable supraglottic mass was found, which seemed to be a laryngeal mass recurrence. According to the review of literature, the patient was the first case of laryngeal paraganglioma with concurrent jugulotympanic and parapharyngeal masses. Jugulotympanic paragangliomas are also slow growing masses with few symptoms, such as pulsatile tinnitus, aural fullness or hearing loss. Larger tumors may result in cranial nerve deficits, as seen in thispatient.Computed tomography, magnetic resonance imaging and arteriography are the main imaging modalities of choice for the evaluation and diagnosis of paraganglioma. These modalities are very effective for evaluating the anatomical relation and extension of the tumor with other structures. Although surgical excision with free margins is the treatment of choice for paragangliomas, radiation therapy (RT) is an effective treatment in particular conditions. These situations consist of tumors with extensive intracranial or skull base involvement, multicentric tumors with possible postoperative debility from cranial nerve damage, and poor risk patients or those who do not accept surgery (7). In these cases, conventional irradiation, laser or gamma knife irradiation is most often used. There are some reports that RT offers excellent control for unresectable masses and can also be employed as an adjunct to operations for tumors or metastases that have been incompletely excised. Furthermore, previous reports found no superiority of subtotal resection and radiotherapy over radiotherapy alone. Therefore, one should choose radiotherapy or surgery in accordance with the risk of treatment complications (8).